Now here is a killer song that I haven’t seen celebrated nearly enough. I first learned it from Charlie Rich’s version, cut for his first LP on Epic with Billy Sherrill producing. Charlie’s version is masterful, but this original recording by Ben Peters (the song’s author) equals or surpasses it. I don’t understand why it wasn’t a huge hit. Clearly it was inspired by the success of the erstwhile collaborations of Glen Campbell and Jimmy Webb, what with its combination of a specific place name in the title, a sad narrative story, a tenor lead vocal, and a swirling countrypolitan arrangement. But to me it wildly exceeds the mere imitation of an already proven formula. Great chord changes, a long slow build of story and melody, not a word wasted or out of place, a perfect bridge, and then that stirring melodic vocal climax at the end…what a marvelous piece of songcraft. 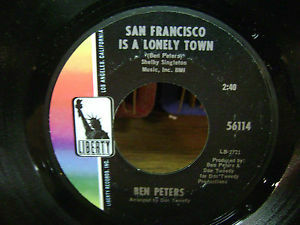 And yeah, the essential truth that San Francisco can indeed be a very lonely place for all of the people who flock to it…what can I say, this terrific little record just speaks to me.